I am just about old enough to remember the days when seed companies and parks departments put on spectacular displays at the Chelsea Flower Show each May, filling their stands with fairly common plants, grown to a standard of perfection that rivalled the skills of Victorian Head Gardeners. Hardy annuals would be sown in autumn and kept in a cool greenhouse to reach a state of grandeur spring-sown plants could never match. And among these were schizanthus. 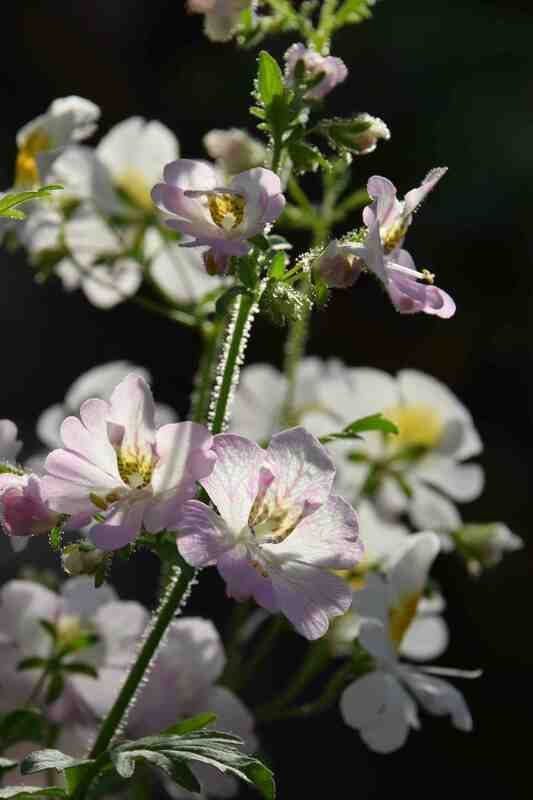 I have loved schizanthus ever since. I have not really given my plants the best treatment and I am very tempted to sow some in August to try to emulate the perfection of the past. But, for now, my February-sown plants are just starting to come into bloom. A problem is that most seeds available today are of modern strains that are dumpy and have rounded flowers that lack all the grace and daintiness of the older, taller growing types. Yes, modern kinds have larger flowers and bolder colours but I don’t like them. So mine are ‘Dr Badger’s’ strain. The colours here are not representative – there are other colours in the mix but these pinks are the first to open. 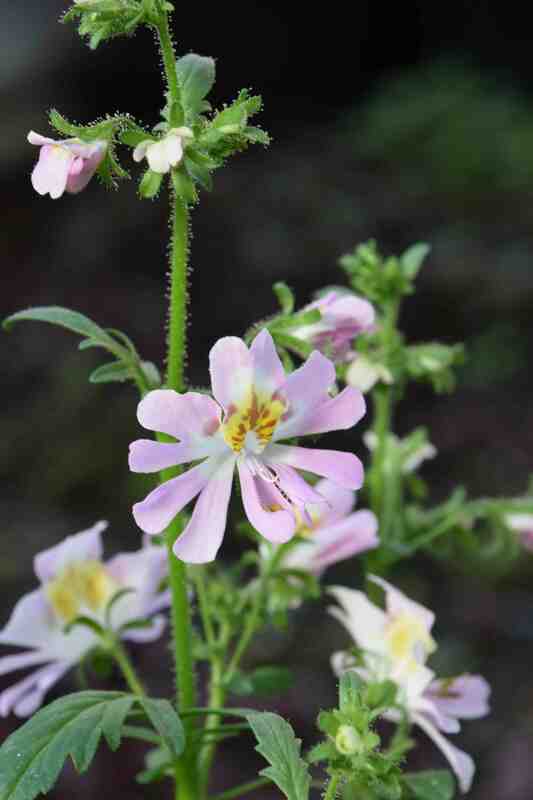 Amazingly, schizanthus (the name means ‘split flower’) are in the tomato family and the genus is centred on Chile. I cannot think of any other genus in the family that has zygomorphic flowers*. These schizanthus are S. x wisetonensis, a hybrid of the bee pollinated S. pinnatus and S. grahamii which is pollinated by humming birds. Although they are annuals or biennials and look so exotic, these plants do not want or need a lot of heat which is why autumn sowing is such a good way to deal with them, if you can keep them free from frost. 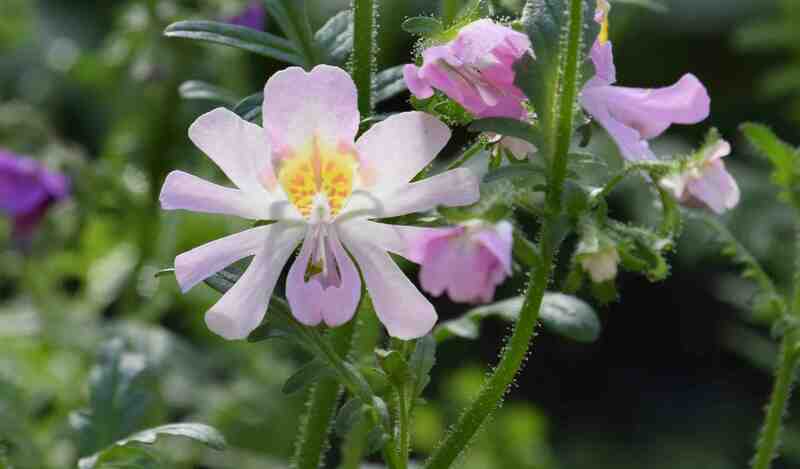 It allows the plants to build up for flowering slowly so you get a much bigger plant than these spring-sown seedlings which rush to bloom as the hours of sunlight exceed 12 a day. 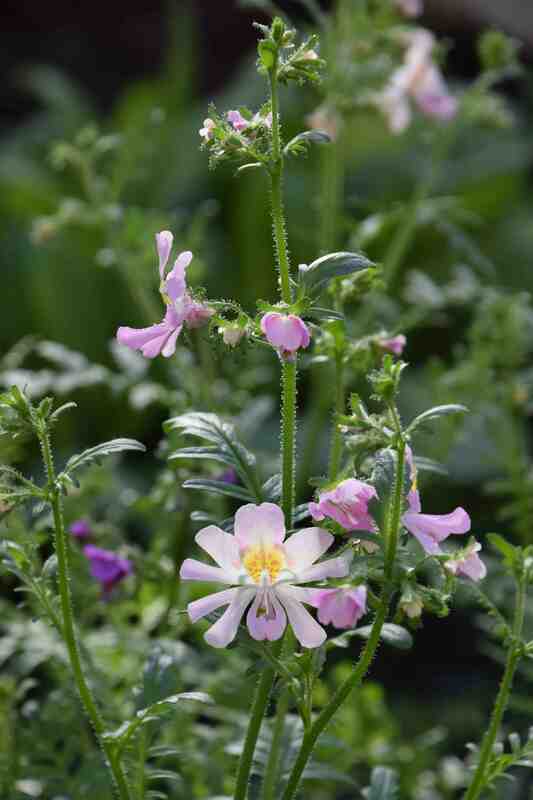 As bedding plants they are not ideal, being rather delicate in habit and only flowering for a month or so. But as an easy-to-grow treat they are beautiful. * Zygomorphic flowers have bilateral symmetry. That means that the flower is symmetrical along one line only – in this case from the top to bottom. Imagine holding a mirror upright along the centre of the flower – the two sides are identical. All other solanum flowers are actinomorphic and have radial symmetry. You can draw a line across the flower in many places to divide the flower into two identical parts. Having said that some have a little irregularity and have a bit of a lopsided look: petunias, tomatoes, potatoes and aubergines are rarely exactly actinomorphic.